People who are new to Fasting often pose the questions: “Can I really eat ‘anything I want’ on a Slow Day?” and “What should I eat on Slow Days?” To answer those questions, I have decided to add some blog posts to show some of the foods we eat on what the world calls NFDs [non-fast days] but which, in our house, we call ‘Slow Days.’ This feature will appear sporadically. Now for the answers. Can you really eat ANYTHING you want on a Slow Day? Not really. If you eat too many calories every Slow Day, you will not lose weight. There are many questions asked on the FastDiet Forum which tell the tale. But once in a while your can splurge, as long as it isn’t every day. For what to eat on Slow Days, Dr. Mosley recommends a Mediterranean Diet. As for how we eat, an example follows. Lime-marinated chicken came to us from our younger son and his friend Angela, both of whom are very handy in the kitchen. The marinade is simplicity itself, but the meat must sit in it for 4+ hours — so plan ahead. What seems to be a puny amount of marinade grows into a lot more as time goes on. Use it for basting. The chicken can be grilled or baked. note: I skinned half of the chicken to account for varying tastes. Fine either way. Served with sliced tomatoes and potato salad, this is one of those prefect Summer meals. PS: We always use this for chicken, but our son says it is fabulous with pork, too. Pan Bagne means ‘bathed bread.‘ It is a layered sandwich which is ‘bathed’ in an olive oil dressing. We like it for 2 reasons: a] it is delicious; b] it should be made a day or two ahead of when you need it. Easy to prepare, once you have assembled the ingredients, Pan Bagne makes a delightful meal for summer entertaining or for a picnic. We especially like it as end-of-the-road food: for when we have traveled long hours to our vacation cottage. After unpacking, the Pan Bagne is brought out [after 2 days of cooling], sliced, and served with a chilled drink and a sigh of relief. Here it is offered up with A Rossignol Estate Saint Jean White. People who are new to Fasting often pose the question: “Can I really eat ‘anything I want’ on a Slow Day?” and “What should I eat on Slow Days?” To answer those questions, I have decided to add some blog posts to show some of the foods we eat on what the world calls NFDs [non-fast days] but which, in our house, we call ‘Slow Days.’ This feature will appear sporadically. Now for the answers. Can you really eat ANYTHING you want on a Slow Day? Not really. If you eat too many calories every Slow Day, you will not lose weight. There are many questions asked on the FastDiet Forum which tell the tale. But once in a while your can splurge, as long as it isn’t every day. For what to eat on Slow Days, Dr. Mosley recommends a Mediterranean Diet. As for how we eat, an example follows. We had arrived back home after a few days away, and needed a quick meal. A trip to the local fish market gave us the idea of stuffed haddock, always a favorite. There were odds and ends of items in the ‘fridge: some snap beans, a little lettuce, some pickled vegetables [see SPICY, posted 12 Sept, 2018], and some leftover artisan bread. Herbs from the garden and a nice Rossignol Estate Winery ‘L’Acadie Blanc‘ rounded out the meal. How this Fast Diet Lifestyle works: Eat these meals tomorrow. On Thursday, eat the meals that will be posted on Wednesday. Eat sensibly the other days of the week. That’s it. Simple way to lose weight and be healthier. Welcome to Adrian K. who is now Following. Jean Calvin [aka Jehan Cauvin] was born on Monday, July 9, 1509. Little did his parents in town Noyon, Picardie know of the tremendous impact their son would have on their country’s society and religious life. Destined for the clergy, Calvin grew up in the shadow of Martin Luther’s ideas to reform the Church. His father’s falling out with the local church elders steered young Jean to the law. In the 1530s, Calvin grew into a new theology, a synthesis of the ideas of Luther, Zwingli, and other leaders of Protestantism. Through studies in Basel, Switzerland and Strasbourg [then in Germany] Calvin went on to organize and codify the new church. From the Cathedral of Saint Pierre in Geneva [where you can still see ‘Calvin’s Chair’], he oversaw the training of priests, the writing of liturgy, and the spread of the Reformation through his homeland. For the next hundred years, France was torn apart by religious wars as the Protestant Huguenots fought with the Catholics to worship as they pleased. Calvin believed in predestination, but you are not pre-ordained to be over-weight. Enjoy eggs baked with the Camembert cheese of North-Eastern France for breakfast, as a way to begin Fasting. And since Picardie borders the ocean, Mackerel will be our dinner and I’m sure Calvin would approve. Camembert Bake: 287 calories 10 g fat 2.5 g fiber 14.3 g protein 35 g carbs [32 g Complex] 241 mg Calcium PB GF The best-known cheese of Normandy stars in this egg dish. Easy to prepare and so delicious. I hope you will try it. Cut the cheese [rind and all] into small chunks and leave to soften at room temperature. Stir in the mustard and nutmeg. Whisk the egg, then stir in the cheese mixture. Pour into an oven-proof dish that has been spritzed with non-stick spray and bake at 350 F for 12-15 minutes. When the beverages are ready, plate with the fruit. Mackerel with Gooseberry Glaze: 276 calories 16 g fat [Omega 3 fat!] 0.9 g fat 22 g protein 7.3 g carbs 26.7 mg Calcium PB GF This popular dish from Normandy usually features fresh gooseberries. Here in the USA, those are less common, so we make a glaze of gooseberry jelly. The zucchini picks up the color of green gooseberries. Heat the oven to 300 F. Put frozen or fresh fish on a baking tray and brush with melted jelly. Using a potato peeler, carve long, thin slices from the length of the zucchini until you have 3 oz. Toss the ribbons with salt and pepper. Place the ribbons on the baking tray in a heap [if they are in a thin layer, they will over-cook]. Bake for 5 minutes. Rearrange the zucchini so that the bottom layer is now on top. Bake 5 minutes more, or until the fish is thawed or cooked. Plate the fish with the zucchini ribbons for a remarkable flavor. Ground Hog Day is a ‘cross-quarter day’ which falls equidistant between the Winter Solstice and the Vernal Equinox. In pre-Christian times [and even beyond] it was the occasion for minor celebrations. Our myth of the groundhog being a weather prognosticator goes back to old Germany. Then there is the Bill Murray and Andie McDowell film, in which the anti-hero is doomed to relive the same day over and over until he gets it right. In that vein, I will repeat myself and give you 12 tips for getting on and staying with the Fast Diet. 1. Watch the video of Dr Mosley’s program Eat-Fast-Live which we saw originally on PBS. http://www.dailymotion.com/video/x18a1b6_michael-mosley-eat-fast-live-longer_lifestyle This is what inspired us to start this Lifestyle and it might help you too. 2. Plan ahead. We write on the calendar what Fast meals we want to eat in a week. Nothing ruins a diet like coming home and having no idea what to eat for dinner. That’s when the default foods come out [carry-out or pizza]. You can avoid that by planning. 3. Prep ahead. You see in many recipe the HINTS about preparing food ahead. This is a real time-saver in the morning. Want your spouse to help you to stay on the diet when you get home late? Write out the recipe, leave it on the counter, include info about where to find ingredients, and maybe the meal will be in progress when you come through the door. 4. Shop ahead. Now that you know what you want to eat, have the ingredients on hand. When Fast Day comes, you want to be ready. 5. Portion as you shop. A recipe calls for 4 oz chicken breast: so when you get home, cut the chicken into the correct size. Wrap and label the part you need, save the trimmings for another use such as Chicken Curry or Chicken Noodle Soup. The same goes for vegetables: slice and chop those 2 oz of bell pepper that you will need. It takes moments to do this as you unload the groceries, so do it to save time later. 6. Listen to Diane Rehm interview Dr. Mosley. http://thedianerehmshow.org/shows /2013-03-13/dr-michael-mosley-fast-diet Diane asks the tough questions and ends the conversation by saying that everyone on her staff can’t wait to try the diet! 7. Make the meal setting special. Instead of eating on the run or while standing over the sink, make a Fast meal an occasion. Use the good plates and flatware. Put the sparkling water in a nice glass with a twist of lemon. 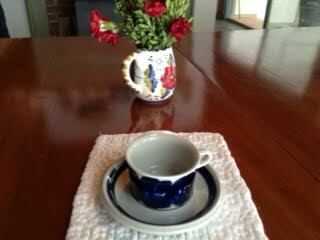 See the demitasse cup in the photo? It is the only one I have and it makes the breakfast table so pretty that it is saved for Fast days only. 8. Slo-o-o-ow down the meal. The other reason for the little cup at breakfast? By putting the coffee in a pitcher, I frequently have to stop to refill the cup. This bit of fussiness slows down the process. When you put food in your mouth, put down the fork. You don’t have to chew 30 times, but don’t simply cram the food in your mouth — savor it, taste it, and make it last. 9. Set goals by the clock. After breakfast, vow not to put any calories in your mouth until noon. Then at noon, tell yourself that you can hold out for another 2 hours. Maybe setting a timer will help you: while the timer is ticking, don’t eat. This does not mean that you will eat when the timer rings! No. Set a new goal. 10. Distract yourself. After breakfast, I pour a large [1.5 cups] glass of water which I sip on until 2 pm. Then I have earned a hot cup of tea — something bold-tasting or soothing as mood dictates. A touch of honey in the drink provides a real lift. Mid- to late afternoon is difficult for me. Go for a walk [not to the kitchen or break-room!] or get involved in a long project to take your mind off eating. 11. Hide the temptation. I stash the bowl of pistachios in the cupboard on Fast Days. Yes, I still know they are there, but out of sight, is out of mind. 12. Don’t Stop Thinking About Tomorrow. This has a double meaning. 1] If you yearn for something on a Fast Day, tell yourself that you can have it tomorrow. It is not a promise that you have to keep. Tomorrow it might not be calling to you. 2] Tomorrow is the day that you will weigh less. Tomorrow is also weeks from now when you will be slimmer and thinking about new clothes. Tomorrow will come. 500 years ago today, Europe woke up to a new world view. Martin Luther had posted his 95 Theses which sought to reform the Roman Catholic Church, not to over-throw it. The printing press made his ideas ‘go viral.’ Among his radical ideas: printing the Bible in the language of the country so that people could read it for themselves. [Literacy soared as a result.] Luther also got congregations singing in church. [A grand experience.] According to Martin Marty, Luther’s gospel of forgiveness means that tomorrow is a new day. And let’s not forget education for both boys and girls. One of the best books that I can recommend for your reformation is the Fast Diet by Michael Mosley and Mimi Spencer. How are we reformed since reading it? We are slimmer for sure. We eat in moderation. We are more mindful of what we eat and when we eat it. Reform your diet method. How do today’s menus relate to the Reformation of 1517? Well, since our sons have reformed our tastebuds by introducing us to flavors we never imagined, the breakfast is a real eye-opener from our younger son. The dinner is in honor of Martin, the good German monk, who surely would have enjoyed sauerkraut and sausage. Thai ScrOmelette: 279 calories 8.5 g fat 2.1 g fiber 16 g protein 36 g carbs 249 mg Calcium PB GF Our younger son prepared a marvelous Thai fried rice dinner for us which bowled us over with its flavors. Here are the same flavors, without the white rice. Still marvelous. Combine the garlic, scallions, spinach, the 2 sauces, and basil. Spritz a fry pan with olive oil or non-stick spray. Heat the pan and stir the vegetables until they are warm and soft. Whisk the eggs and pour them into the pan, stirring to mix with the vegetables. Cook until done to your liking. Plate with the fruit and enjoy with the beverages. Sauerkraut and Sausage: 255 calories 5.7 g fat 12.6 g fiber 21.3 g protein 33.5 g carbs 196.4 mg Calcium GF PB Does this meal make you picture over-weight Teutons? Brunhilde, anyone? Now look at the calorie count. 1.5 cups sauerkraut, canned or bagged or fresh 2 tsp caraway seed 2 oz applesauce, unsweetened 1/2 cup onions, chopped coarsely 1 Dakin Farm cob-smoked chicken sausage with apple [OR any other sausage with 110 calories] left whole or sliced into ½” chunks 1.5 cups raw collard greens, chopped or sliced cross-wise in 1/4” strips [chiffonade] salt, garlic powder, and pepper to taste. Thaw the sausage if it is frozen. Combine the sauerkraut, caraway seed, applesauce, and onions in a saucepan large enough to hold the sausage [if leaving whole]. Cook slowly, uncovered until half of the liquid is gone. Add the sausage, cover, and continue to cook until everything is hot. Meanwhile, put the collards into ½ cup water with seasonings, and cook covered until the greens are tender, about 10 minutes. This is not an homage to a band wearing crazy make-up, but a return to the adage “Keep It Simple, Stupid.” While some would bristle at the implication of being called an imbecile, I am aware that oft-times recipes can get rather involved and complicated. If you don’t care for cooking or you don’t have time, a long-winded recipe can be daunting. In these early weeks of back to school, when getting into new schedules is anxiety-producing, I propose the most simple of menus. Originally created for our friend Lillian, these should find a place in your menu rotation any time you need to Keep It Simple. Put the olive oil, onion, carrot, celery, garlic and pepperoni into a sauce pan together and cook over medium heat until onions begin to wilt. Add the sweet potato, zucchini, mushrooms, tomatoes, white beans, herbs, and water. Cook at a simmer for about 20 minutes. Add the pasta and cook until it is soft. Add remaining ingredients. Taste and adjust for flavor. HINT: This recipe made 4 cups for me – 3 future meals from this recipe! Thinking of starting a diet but afraid of what you’ll have to give up? No more pizza! NO-O-O-O! Here are two facts: 1) on the 5:2 diet, you can eat the foods you like 5 days a week, even pizza; 2) today’s recipes give you the tastes of pizza as breakfast and dinner. Pizza ScrOmelette: 291 calories 8.8 g fat 1.7 g fiber 15.6 g protein 35.7 g carbs 250 mg Calcium PB GF Your favorite flavors at breakfast – delicious. Chop or dice the bell pepper and cook it in a pan spritzed with non-stick pan. Chop the pepperoni and stir it in with the cheese, tomatoes, and peppers. Whisk the eggs with salt and pepper. Pour into a pan which has been sprayed briefly with cooking spray. When the bottom of the eggs have set, add the cheese mixture and scramble to your heart’s content or fold like an omelette. Brew your beverage, portion the fruit, and take the previously-made smoothie from ‘fridge. Truly a treat. Pizza with Vegetable Topping: 300 calories 13.3 g fat 4 g fiber 14 g protein 19 g carbs 269 mg Calcium PB Another winner from the Fast Diet book. The pizza shells are either whole grain wraps or corn tortillas. BE CAREFUL about the calorie and fat content when shopping! I get Herdez 8″ whole wheat fajita style tortillas. Each has 170 cal and 5 gm protein. Each person gets ONE of these pizzas. OR you could get Olé brand 6″ corn tortillas. Each of those has 65 cal and each person gets THREE AND a HALF pizzas. Set the oven at 400° F. Place the tortilla on an ungreased baking sheet and put it in the oven for 2 minutes to warm and stiffen. Put dollops of tomato purée on each tortilla and spread it around. Toss together mozzarella, mushrooms, red pepper, spinach, and onion. HINT: Sometimes I cook and chop all the veg and put them in a bag in the freezer to save time on a FAST day. Divide the mixture among the tortillas and sprinkle the seasonings on top. Bake for 5-10 mins at 400° F.
How this Fast Diet Lifestyle works: eat these meals tomorrow and eat the meals that will be posted on Wednesday. Eat sensibly the other days of the week. That’s it. Simple way to lose weight and be healthier. Mediterranean Bake: 288 calories 8 g fat 2.4 g fiber 14.6 g protein 38.5 g carbs 234 mg Calcium PB GF Oh! Those sunny flavors! Set the toaster oven at at 350 degrees F. Spritz a ramekin with oil or non-stick spray [this was baked for two servings in a 5×7″ oven-proof dish] and spoon in the Med. Veg. Pop the ramekin in the warming toaster oven for 30 seconds to warm the vegetables. Whisk the egg with the cheese and seasonings. Pour in the egg mixture over the vegetables and bake in the toaster oven for 12-15 minutes, depending on how you like your eggs. Brew your warm beverage; shake and pour the smoothie; plate the fruit. A fine way to anticipate the joys of Summer. Pomelo/Grapefruit-Shrimp Salad: 255 cal 6.3 g fat 3.7 g fiber 22.3 g protein 28 g carbs 93.5 mg Calcium PB GF The pomelos were ripe in our son and daughter-in-law’s garden, so I used some to make this meal. The recipe is from Hot Sour Salty Sweet by Jeffrey Alford and Naomi Duguid. If you can’t find pomelos, use grapefruit instead. I’ll be perfectly honest: although I enjoyed this meal and found it to be delicious, my chief taster thought it was bitter. Some people are more sensitive to certain tastes than others. Next time, I’ll use grapefruit. Mix the fish sauce, lime juice and brown sugar in an oven-proof bowl. Add the shrimp and let marinate. Toast the coconut in a dry skillet until just beginning to brown. Peel and segment the pomelo/grapefruit and remove pulp from the membranes. Put the shrimp and marinade into the microwave and heat until cooked. Gently combine the shrimp, marinade, pomelo, coconut, peanuts, shallot, mint, and chile sauce in a wide bowl. Put the lettuce leaf on the plate and fill it with the salad. In the photo, you see some colorful chips. Those are veggie chips by Terra which add a nice crunch and a few more calories to the meal. Omit if you wish, but do not substitute potato chips!